Gettysburgian to Host New York Times Reporter Elizabeth Williamson | The Gettysburgian. On Friday, Feb. 15, beginning at 4:30 p.m. in the Penn Hall Lyceum, The Gettysburgian will host its belated semester kickoff event, which will feature Elizabeth Williamson, D.C. Features Reporter for the New York Times. The event is free and open to the public, and light refreshments will be provided. 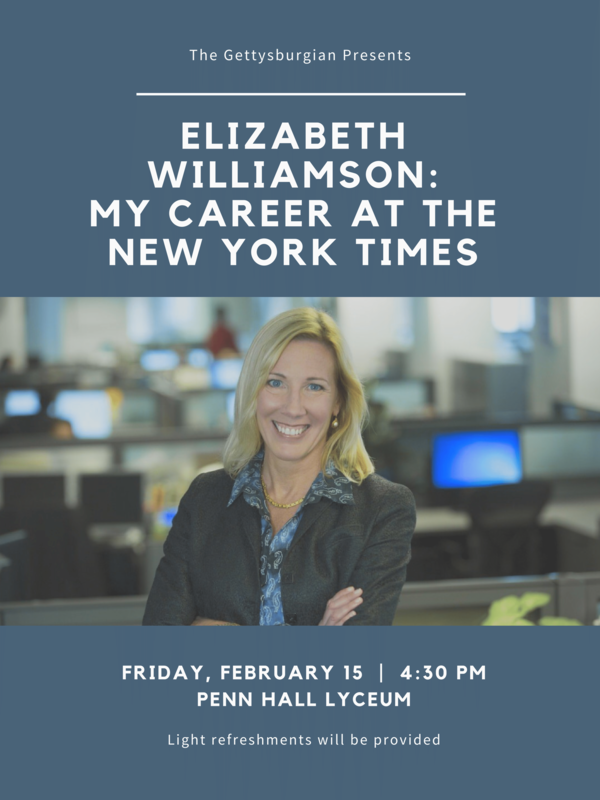 Williamson will discuss her career in journalism, which has also included stops at the Wall Street Journal and the Washington Post, and answer questions from the audience beginning at 5:00 p.m. Notably, she is the mother of Charlie Williamson ’19, The Gettysburgian‘s Sports Editor. The event is co-sponsored by the Provost’s Office. With any questions, please contact Benjamin Pontz ’20, Editor of The Gettysburgian, via email: editors@gettysburgian.com.